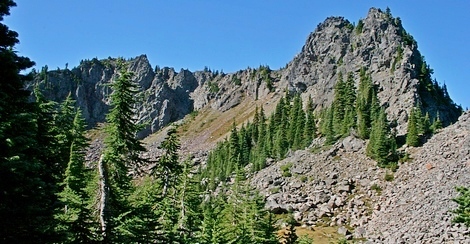 This hike follows Trail #34 off the Forest Road #24. You will hike through fairly dense forest as the trail begins to increase in steepness. At about a mile you will come to a junction of Trail #102. Keep straight ahead as you enter the Indian Heaven Wilderness. The trail becomes much steeper and you will encounter a few switchbacks. You can get an occasional glimpse of Mt Adams as you make your way up some of these switchbacks. 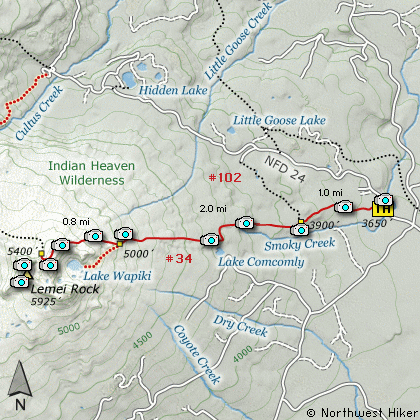 At about 3 miles you will come to the junction with Trail #34A that goes to Wapiki Lake. Bear right and keep climbing steeply toward the ridge above the lake. As the trail nears the summit of the ridge above Wapiki Lake, you will be able to enjoy some of the best vistas in the entire wilderness. Mt Adams is to the northeast, Mt Hood is to the southeast, and Wapiki Lake is directly below you. The trail begins a slow descent as it nears the base of Lemei Rock. On this CD Guide I do not describe how to climb the rock. Rather, I depict hiking up to its base and ridge line which is just northeast of the peak itself. From this easily accessible ridge line you can enjoy views of Mt St Helens to the west, Mt Rainier to the north, and Mt Adams to the northeast.